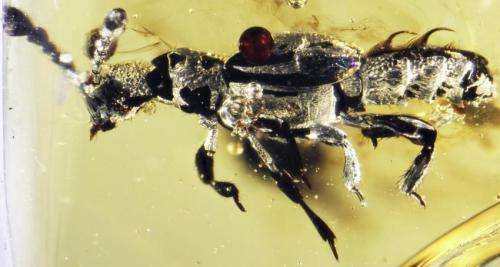 Scientists have uncovered the fossil of a 52-million-year old beetle that likely was able to live alongside ants—preying on their eggs and usurping resources—within the comfort of their nest. The fossil, encased in a piece of amber from India, is the oldest-known example of this kind of social parasitism, known as "myrmecophily." 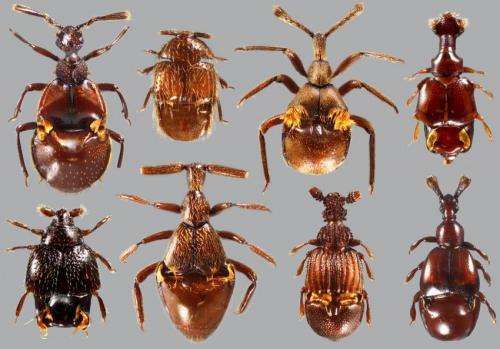 Published today in the journal Current Biology, the research also shows that the diversification of these stealth beetles, which infiltrate ant nests around the world today, correlates with the ecological rise of modern ants. "Although ants are an integral part of most terrestrial ecosystems today, at the time that this beetle was walking the Earth, ants were just beginning to take off, and these beetles were right there inside the ant colonies, deceiving them and exploiting them," said lead author Joseph Parker, a research associate at the American Museum of Natural History and postdoctoral researcher at Columbia University, who is a specialist on these beetles. "This tells us something not just about the beetles, but also about the ants—their nests were big enough and resource-rich enough to be worthy of exploitation by these super-specialized insects. 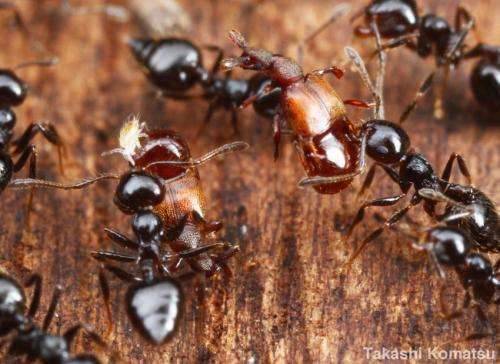 And when ants exploded ecologically and began to dominate, these beetles exploded with them." Today, there are about 370 described species belonging to Clavigeritae, a group of myrmecophilous, or "ant-loving" beetles about 1–3 millimeters in length, and Parker estimates that several times this number of species still await discovery. Remarkable adaptations enable these beetles to bypass the fortresslike security of ant nests, which employ a pheromone code of recognition that ants use to identify, and then dismember and consume, intruders. Through ways that scientists are still trying to understand, Clavigeritae beetles pass through these defenses and integrate seamlessly into colony life. "Adopting this lifestyle brings lots of benefits. These beetles live in a climate-controlled nest that is well protected against predators, and they have access to a great deal of food, including the ants' eggs and brood, and, most remarkably, liquid food regurgitated directly to their mouths by the worker ants themselves," Parker said. "But pulling off this way of life means undergoing drastic morphological changes." Clavigeritae beetles look quite different from their closest relatives, with fusions of segments within the abdomen and antennae—likely meant to provide additional protection from the ants, which often pick the beetles up and carry them around the nest—and mouthparts that are recessed inside the head in order to accept liquid food from worker ants. They also have glands that cover the body with oily secretions, and thick brushes of hair on top of their abdomens, called trichomes, which act as candlewicks and conduct chemical-containing secretions from nearby glands. The makeup of these chemicals is unknown, but they are thought to encourage ants to "adopt" rather than attack the beetles. "If you watch one of these beetles interact inside an ant colony, you'll see the ants running up to it and licking those brush-like structures," Parker said. Although Clavigeritae beetles are species-rich, they are quite rarely encountered in nature and so, unsurprisingly, the newly discovered specimen—brought to Parker's attention by American Museum of Natural History curator David Grimaldi, who is an expert in amber fossils—is thought to be the first fossil of this group to be discovered. Named Protoclaviger trichodens by Parker and Grimaldi, the Eocene fossil is from an amber deposit in what was once a rain-forest environment in modern-day India. Although its body is very similar to modern Clavigeritae beetles, with two stark, hook-like trichomes, some of its characteristics are clearly more primitive. For example, Protoclaviger's abdominal segments are still distinct, whereas in modern beetles they are fused together into a single shieldlike segment. "Protoclaviger is a truly transitional fossil," Parker said. "It marks a big step along the pathway that led to the highly modified social parasites we see today, and it helps us figure out the sequence of events that led to this sophisticated morphology."